VEGETARIAN PAD THAI (ALMOST) - JUST EGGS AND FISH SAUCE KEEPS IT OFF THE STRICTLY VEGETARIAN LIST. I'm sure you can eliminate the eggs and use a soy sauce base to replace the fish sauce. Pad Thai is the National Dish of Thailand and is also the favorite dish for Westerners who are just beginning to taste the fresh and marvelous cuisine of that country. Thai food can be spicy hot, but need not be. Just go light on the peppers and hot sauces until you find your toleration zone. Spicy Thai is an adventure that takes a little time to get used to. 1. Fry the chopped garlic and onion until turned yellow. 2. Add  the tofu and fry until cooked. 3. Add the pickled  white radish. 4. Break the eggs into the  pan  and scramble. wedges of lemon or lime. ination of tamarind, sugar, fish sauce, vinegar, tomato paste and chili pepper. 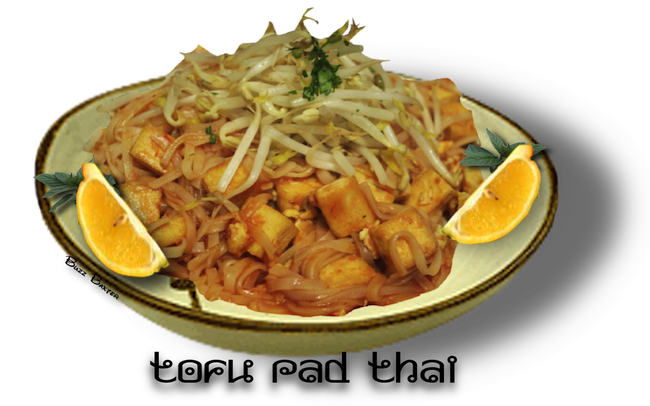 Flat Wok Pad Thai / ImportFood.com Thai Street Vendor Video Series ✯ Watch more Videos at Vodpod.